Recorded/performed at: Recording Studio, School of Music, Australian National University, Canberra, on Dec 10. Ross Edwards Matthew Withers 7 mins, 17 sec. Recorded/performed at: Recording Studio, School of Music, Australian National University, Canberra, on Dec 10. Nigel Westlake Matthew Withers 8 mins, 19 sec. Also includes: Zapateado / Regino Sainz de la Maza -- Campanas del Alba / Eduardo Sainz de la maza -- Usher waltz / Nikita Koshkin. Featuring a worldly blend of compositions by Australian, Spanish & Russian composers, this disc contains beautiful singing melodies and strong rhythms. 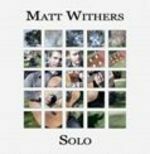 Score: Blackwattle caprices : for solo guitar / Ross Edwards. 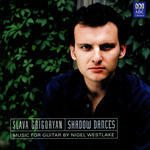 CD: Shadow dances : music for guitar by Nigel Westlake / Slava Grigoryan, guitar. 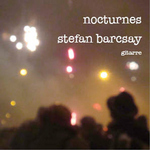 CD: Nocturnes / Stefan Barcsay. 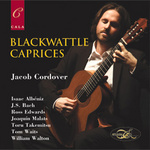 CD: Blackwattle caprices / Jacob Cordover.